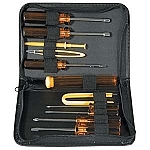 Among our assortment of punch down tools we have 66 Adjustable Impact Punch Down Tools with blade, 110 Adjustable Impact Punch Down Tools with blade, 66/110 Adjustable Impact Punch Down Tools with blade, 110 Non-Impact Punch Down Tools, and 66/110 Non-Impact Punch Down Tools. Impact and Non-Impact Punch down tools may come with or without blades, you are also able to get replacement blades separately. Also available is a keystone jack punch down stand that works with Cat5e, Cat6, RJ11/12, and keystone jacks. 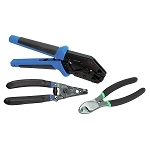 Impact and non-impact punch-down tools are ideal to use by network and phone wiring professionals.